Despite Criticism, Arkansas Passes Religious Freedom Bill : The Two-Way The measure is similar to the controversial law passed by Indiana. Gov. Asa Hutchinson had previously said he would sign the bill into law. 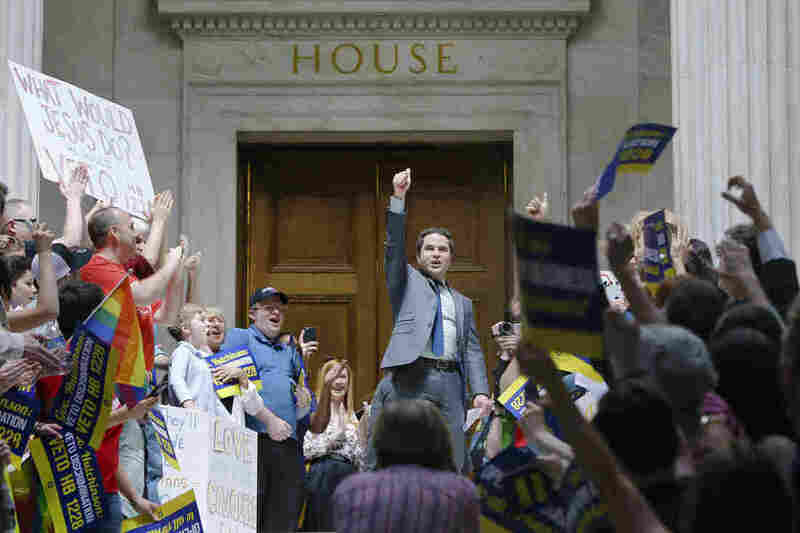 Rep. Warwick Sabin, D-Little Rock (center), leads protesters outside the House chamber at the Arkansas Capitol in Little Rock on Monday. Despite criticism and protests, Arkansas legislators passed a religious freedom bill on Tuesday that is similar to the one passed by Indiana. "Protesters gathered outside the governor's mansion in Little Rock on Tuesday morning. A final vote in the state House could come later in the day. "The Indiana law, enacted last week, and the proposed Arkansas law were presented as ways to keep government from infringing on religion. But opponents say they could be used as cover for discrimination, allowing businesses to refuse to serve gay and lesbian customers." The Arkansas Times reports that Gov. Asa Hutchinson had previously vowed to sign the bill into law, but all the controversy in Indiana may affect his decision. Citing unnamed state Capitol sources, the paper reports that "particularly with the increasing volume of media coverage and corporate backlash around the similar law in Indiana, the governor has real concerns about the law's impact on economic development, sources say." As we reported, as criticism and threats of boycotts of the state mounted, Indiana Gov. Mike Pence stuck by the law but said legislators would clarify the legislation. "We'll fix this and we'll move forward," Pence said at a press conference.
" 'If you start shaving out exemptions in laws, next thing you know, you'll gut the law because everyone will want an exemption,' said State Senator Bart Hester, an Arkansas Republican and one of the bill's lead supporters. "The attention turns to Governor Hutchinson, a moderate Republican who ran on a jobs platform and managed to extend a tailored form of Medicaid expansion in this Republican-controlled state." In a statement, Walmart CEO Doug McMillon asked Gov. Hutchinson to veto the religious freedom bill passed today. "Every day in our stores, we see firsthand the benefits diversity and inclusion have on our associates, customers and communities we serve," he said. "It all starts with our core basic belief of respect for the individual. Today's passage of HB1228 threatens to undermine the spirit of inclusion present throughout the state of Arkansas and does not reflect the values we proudly uphold."